The effectiveness of the wet processes investigated by the project team, such as bleaching and dyeing of coir, are strongly dependent on the procedures used to extract fibres from the husks and the pretreatment given the fibres. Both state-of-the art and commonly used technologies for fibre extraction are described. The traditional production of fibres from the husks9,10,11,12 is a laborious and time-consuming process. This is highly polluting of surface waters13,14,15 and results in the accumulation of large dumps of pith. After manual separation of the nut from the husk, the husks are processed by various retting techniques, and generally in ponds of brackish waters (for three to six months) or in salt backwaters or lagoons. This requires 10-12 months of anaerobic (bacterial) fermentation. By retting the fibres they are softened and can be decorticated and extracted by beating16, which is usually done by hand. After hackling, washing and drying (in the shade) the fibres are loosened manually and cleaned. Traditional practices of this kind yield the highest quality of (white) fibre for spinning and weaving. Retted fibres from green husks are the most suitable fibres for dyeing and bleaching. Alternatively, mechanical processing using either defibering or decorticating equipment can be used to process the husks after only five days of immersion in water tanks. Crushing the husk in a breaker opens the fibres. By using revolving drums the coarse long fibres are separated from the short woody parts and the pith. The stronger fibres are washed, cleaned, dried, hackled and combed. The quality of the fibre is greatly affected by these procedures. New environmentally friendly methods of fibre production are of interest. These can be locally exploited on relative small-scale, and have the potential to produce a more constant quality of fibres. Novel developments by the CCRI using a biotechnological approach with specific microbial enzymes17, for example, have substantially reduced the retting time from three to five days. High quality fibre production has been maintained. Similar protocols can be developed to enhance the properties of the fibres with regard to surface properties such as smoothness and porosity. By using specific (microbial) lignolytic enzymes (laccase/phenoloxidase), the fibre surface can be bleached (or activated to react more easily with the dyes). Similar technology has been developed by NOVO-Nordisk to reduce the amounts of chemicals required to produce wood chips or fibreboard18. The different fibre extraction processes yield different but also varying qualities of fibres: generally 56-65 per cent long fibres of over150 mm (up to 350 mm staple length) and 5-8 per cent short fibres of under 50 mm. The fibre fineness varies between 50 and 300 µm. The fibres are composed of individual fibre cells of about 1 mm length and 5-8 µm diameter. The tensile strength of coir is relatively low when compared to sisal or abaca fibres, but it is less impaired by immersion in water19. Coir fibre has the advantage of stretching beyond its elastic limit without rupturing, as well as having the power to take up a permanent stretch. Its resistance to microbial degradation and salt water is unique. The chemical composition of coir and other plant fibres is given in Table 3, which shows that brown coir fibres contain relatively low amounts of cellulose (35 per cent) but have high lignin content (32 per cent)20. This exceptionally high lignin content implies that the available dyeing and bleaching techniques for textile fibres cannot simply be transferred to coir. Bleaching of coir fibres and yarn is undertaken to obtain lighter coloured fibres and more commercially attractive products. Coir yarns and fibres are bleached enhance the performance and appeal of the products (for example, for mats and matting). Bleaching provides for the production of lighter shades of fibres and yarns, and the fibres produced will be light yellow instead of brown. Several hues and (pastel) shades of dyed coir can be obtained when the coir is bleached. It is estimated that 20 per cent of the coir fibres and yarns used in the production of mats, matting, rugs and carpets are bleached. The target of the CFC/FAO project has been to standardise the bleaching processes used in the coir industry, and to develop a low cost bleaching process that also improves the light fastness of the bleached coir products. Chemical methods for bleaching lignocellulosic fibres have been developed in textile and paper and pulp industries23. The different conditions of bleaching (chemical concentrations, pH, temperature and time) will affect the fastness of the bleached products and the properties (tensile and softness) of the fibre. The bleaching process is designed to remove the coloured components or to convert them to colourless substances. Either by reduction or oxidation, the conjugated double bonds responsible for absorption of light in the visible wavelength range can be eliminated. The lignin component in the cellulosic fibres is the main characteristic that will determine colouring. Because of environmental concern, the use of chlorine dioxide based bleaching stages has been eliminated in most industrial bleaching procedures. The interest in totally chlorine free bleaching processes has led to the development of peroxide based bleaching. Hydrogen peroxide is a universal bleaching agent, which is cheap and can be used safely. However, hydrogen peroxide is an irritant for the eyes and respiratory system, and it is important to adopt safety measures to protect workers in the bleaching plant. (Figure 2). The efficiency of peroxide bleaching can be affected substantially by pH or by the presence of contaminants in the processing water (e.g. ionic metal complexes). For efficient use of chemicals (such as buffers and sequestrates), methods to prevent premature degradation of the peroxide can be adjusted to suit the available water quality. Under alkaline conditions, hydrogen peroxide is unstable and decomposes to produce reactive oxygen, which provides the bleaching effect. The addition of magnesium sulphate and sodium silicate to the medium is required to stabilise the peroxide in alkaline conditions. Surfactants are used to increase the fibre surface reactivity. Other components may consume large parts of the reactivity (transition metal ions and anti-oxidants). For the bleaching process it is important to achieve the optimum degree of hydrogen peroxide stability, so that the full potential of the bleaching activity can be exploited. Recipes for bleaching coir fibres effectively without the use of halogen-containing chemicals have been devised at the CCRI24. After a survey of the common practices used by industry, a choice was made for a standard process based on bleaching performance and cost (as described in Appendix A). The hydrogen peroxide treatment was demonstrated and proved to be the preferred method for cold or hot bleaching of coir fibres (Figure 2 and 3, respectively). Hydrogen peroxide bleaching of coir fibres has now become common practice in the coir processing industry in India. Chlorine treatments have been reduced substantially, whereas they were commonly used in the past. A combined process with bleaching powder (containing five per cent Cl2) and peroxide bleaching was selected as the most effective and cheapest available. A substantial reduction of costs has been obtained by the introduction of novel peroxide bleaching recipes by industry. The use of peracetic acid as a bleaching agent has recently received more attention. The results so far with coir were not satisfactory and more recipes need to be explored in the future. Peracids are highly reactive and have a high oxidation potential. Prolonged storage is unsuitable for peracids and thus on-site production is preferred, which has been one of the limitations of commercial adoptation and use so far. The possibilities for bleaching at acidic pH levels may offer some advantages over alkaline processing with regard to strength and softness of the final fibre product. There is a need for further investigation on chemical aspects of bleaching of coir with peracetic acid. New recipes reported to be applicable for bleaching of other lignocellulosic raw materials (for example, wood pulps25 and jute26) need to be tested on coir fibres. In addition to chemical bleaching, opportunities for bio-bleaching of coir were of interest to the project team at the CCRI, and were investigated within the programme of the CFC/FAO project. The effects of specific microbial enzymes on the bleaching of coir are currently under review. The effects of anaerobic microbial (enzyme) treatment on the bleaching of fibres appear to offer promise. A pilot study has been carried out on the capacity of certain bacterial strains to facilitate bleaching procedures27. Previous successes with biotechnological improvements for coir retting and composting of coir pith encouraged this approach. Based on relevant literature data, microorganisms and enzymes were identified that could be exploited for the development of biotechnological bleaching procedures. Microbial cultures were purchased and conditions studied for maintenance, growth and multiplication. The effectiveness of biological treatments on the bleaching of fibres remains to be established. The costs for these treatments are difficult to assess, and have not been indicated in reporting. The investigations require a more fundamental approach and greater use of the analytical equipment made available by the CFC/FAO project. The goal of bio-bleaching is to imitate the wood-decaying action of white rot fungi. The action of specific enzymes that are able to remove the lignin from the cellulose fibres has been reported for pulp bleaching, and is being commercialised as a bleach booster28. The action of xylanases and/or cellulases is used to liberate lignin from the cell walls. By degradation of xylan from the fibre surface, lignin can be more easily removed. In order to maintain the mechanical properties of the fibre, treatment should not result in a degradation of fibre strength. Since fibre strength is directly related to the degree of cellulose polymerisation, only surface action by the cellulytic enzymes is desirable. In the case of coir, however, the relatively large quantities of lignin in the fibre play an important role in the integrity of the fibre structure. Lignolytic enzymes, for example, phenoloxidase, peroxidase and laccase can achieve degradation of lignin. The various bio-bleaching systems are considered useful as pre-bleaching steps, which provide a higher brightness. Analytical methods to measure the amount of residual chemicals (peroxide/halogens/phenolics) in the effluent produced by the bleaching processes need to be investigated and implemented in the research programme to follow the CF/FAO project. At the present, a 10 per cent weight loss is observed when the fibres are bleached, which implies an effluent contaminated with substantial amounts of organic residues. This is typically being discharged without further treatment by local industries. Suitable methods for effluent treatment, chemical recovery and re-use need to be developed. The previous experience of the CCRI with chemical bleaching by local industries was a good basis for the search for improved and standardised bleaching procedures for coir. A literature survey of the various chemical bleaching techniques and a comparison of the methods used by the local processors was undertaken. This took account of the various environmental issues involved. The cost effectiveness of the procedures was also assessed in the review. Although only few international publications and some obsolete literature were quoted by the project team, a reasonably straightforward strategy was chosen for the work planned. Better access to international literature in the fields of interest would have enhanced the efficiency of the researchers, with better use of their time and other resources. A laboratory was set up to carry out the experimental work for improvements to bleaching procedures. A range of recipes was tried, and the yarns compared. Testing of treated samples for lightfastness was performed. Combinations were made with bleaching of pre-treated softened yarns. (See Section 3.4). No quantitative data on bleaching performance, chemical consumption and effectiveness of chemical absorption could be produced, because of lack of equipment or limited experience of the techniques required. Only organoleptic data were given. The effects of bleaching chemicals on yarn strength were measured in a similar manner to that for analysing the softened fibres. There were no indications in the work plan for a more profound use of the analytical equipment made available. Methods for chemical recovery and effluent treatment similar to softening activities should be studied, prior to industrial implementation. The purchase of chemicals needed to carry out the chemical work was sometimes considered a bottleneck for performing the research work efficiently. A selection of essential equipment for undertaking research tasks is required, in addition to the range of analytical tools normally available in an R&D fibres laboratory, for chemical titration of peroxide, pH measurement and similar analysis. These include a reflector/colorimeter or ISO-brightness meter. Preferential climate conditioned testing should be undertaken. One important factor, frequently overlooked in R&D work, is an assessment of the work of the researchers within the international scientific network. For this to be done, it is essential that the work undertaken be published in suitable technical journals. Dyeing of coir products is considered to be essential for diversification of markets and for enhancing the appeal of the products to consumers. Manufacturers and exporters of diversified coir products in India encounter several obstacles when marketing their products, despite the increased demand for ecological products in Western Europe29. Export markets for diversified coir products have come under threat due to bans on the use of certain dyestuffs in the industrial countries. Moreover, ISO-certification and eco-labelling have become common practice for European industry and trade, to provide for an ecologically safe product that can be guaranteed to meet the needs of the customer. The performance of the dyes on coir products should also meet the highest quality standards. The development of environmentally safe and up-to-date dyeing technologies for coir fibre products is essential to enhance commercial viability of what is a valuable renewable commodity. Improved technologies for coir processing and effluent treatment should be suitable for use with local scale production, and also economically feasible to encourage uptake and implementation. Traditional dyeing practices for coir fibres and yarns are widely used in India. 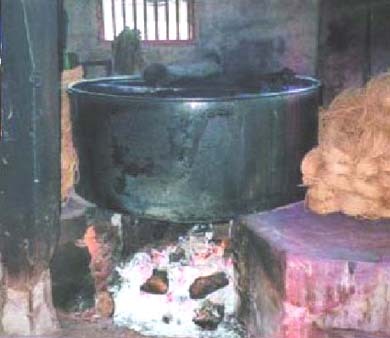 Many co-operative coir mills still make use of outdated dyeing methods using, for example, wood heated tubs with basic dyes, minimum effluent recovery or treatment and labour-intensive practices that can result in poor health and unsafe conditions for workers (Figure 4). These companies mainly supply the domestic market, where the demands on product safety are less strict. The use of banned dyes has, thus far, created few problems for local markets. A willingness to make changes is obstructed by the limited possibilities available for investment in equipment and wastewater treatment systems. Despite government restrictions on effluent disposal, large quantities of exhausted dyes and chemicals are drained and discharged without further treatment. Banned dyestuffs comprise a group of azo-dyes, which are able to release (by azo-reduction) one or more of 20 listed carcinogenic (or potentially carcinogenic) aromatic amines. (See Appendix B). Carcinogenic hazards have been reported especially for benzidine-based dyes30. Banned dyestuffs, of which some remain in common use by the coir industry, are mainly of the group of basic or cationic dyes. In general, the dyeing performance of basic dyes on coir is better than acid or direct dyes. For good adsorption of the dye the fibre must contain acidic groups. This type of dye provides bright shades, which can be attributed to the swelling of the fibres in the alkaline medium. The result is faster and better absorbency of the dyestuff. The fastness of basic dyes towards washing, rubbing and light is less than that for direct dyes. However, the products dyed with direct dyes are considered to be dull, and therefore less attractive to the market. The possibilities for replacing the banned basic dyes by alternative dyestuffs have been explored in the laboratories of the CCRI31. A large number of acid, basic and direct dyes have been tested for their performance on coir fibre dyeing. (See Appendix B). An extensive shade card has been prepared, based on (non-banned) basic, acidic and direct dyes with a large number of recipes for new shades available. Recipes for particular shades can be produced on request for the relatively minor consultation charge of Rs 50 (US$1.25). Acid dyes are most commonly used for dyeing wool and nylon. Amine end groups that play an important role in dye uptake are not present in cellulosic fibres. In cellulosic fibres, the affinity of the dye for the fibre surface is essential. The majority of acid dyes are sodium salts of aromatic sulphonic acids, some of which contain carboxylic acid or phenolic groups. The different dying compounds may contain nitroso, nitro, monoazo, diazo, triphenylmethane and anthraquinone groups. The maximum binding capacity of the fibre is affected by a number of variables that determine dye uptake (such as dye concentration, pH and temperature). Diffusion of the dye anions into the fibre is a major determinant of dyeing efficiency for coir fibres in acidic medium. Swelling of cellulosic fibres under acidic conditions is limited. The degradation of the fibres (hydrolytic depolymerisation of cellulose and lignin) at low pH levels is detrimental to fibre strength properties. Like acid dyes, direct dyes are mainly sulphonated azo compounds (although more complex), which can be directly adsorbed on to cellulosic fibres. Direct dyes are globally classified as benzidine derivatives and related aromatic amino compounds or polyazo dyes, based on amino naphtol sulphonic acids. Direct dyes are applied by boiling the fibre material and gradually adding salt, which promotes adsorption on to the fibre. The affinity of the dyes is affected by salt concentrations (ionic strength) temperature, pH and fibre surface (a feature that can be altered with pre-treatment). The differences in rates of exhaustion of the various direct dyes make dyeing of compound shades difficult to reproduce. Poor washfastness may require after-treatment (with formaldehyde or metallic salts, or diazotizing), which improves the fastness of the dyes. In reactive dyeing, the dye molecules are attached to the fibre via covalent bonding, which imparts superior dye fastness. Highly reactive triazine compounds are utilised as coupling agent between dye and fibre. Most commonly, cyanuric chloride and its derivatives can be combined with water-soluble acid dyes, and react under mild alkaline conditions with cellulose without affecting the fibre structure. Because of high reactivity only mild conditions are needed to couple the dye. A step-wise sequence is applied to form covalent ester or ether bridges with cellulose. In principle, practically all types of chromophores can be coupled in this way. Generally, the dye is applied in a neutral bath with added salt to promote exhaustion. Fixation under alkaline conditions (usually Na2CO3) competes with the hydrolysis of the dye, which reduces dyeing efficiency. Hydrolysis of the reactive chlorine groups occurs as a side reaction in alkaline aqueous systems, which may deactivate the reagent and hinder fixation. Other reactive dyes are based upon diazine derivatives or coupling agents with vinyl sulphone groups. Generally, the reactive dyes are susceptible to acid hydrolysis, although stability depends on the attached chromophore. Vat dyes are water insoluble components, which are adsorbed by the fibre in the form of reduced non-coloured soluble components. By oxidation in air or by the addition of oxidising agents the colour is reproduced on the fibre. A well-known example of a natural occurring vat dye is indigo. Many synthetic variants of indigoid and anthraquinone types of dyes are available. Novel areas of research are planned and should be explored for ecological improved dyeing of coir  to determine methods that may be suitable for domestic industry. Several suggestions have been made to investigate alternative dyeing methods and materials for coir. The use of metal complex dyes (comparable with chromium complexes as are used for wool) has been suggested. A range of brilliant colours can be obtained with chelate compounds using different metal salts as mordents. However, in modern dye-houses the dyeing procedures involving mordents are time consuming, and not used. Further, concern for contamination from effluents containing transition metals or heavy metals has encouraged the replacement of metal complex dyes largely by directly absorbed dyes. Dyeing with food-approved dyes has been suggested, but this will require suitable methods of fixation, which may be achievable by converting them into reactive dyes. This should be further explored, although cost may become a limiting factor. So far, experiments with natural dyes such as henna and tumeric have not been successful since colour fastness have been unsatisfactory. Methods for curing to enhance the absorption/adhesion of the dyes to the fibre surface remain of interest. Experience with industrial dyeing at the CCRI has proven to be particularly useful for project activities focussed on dyeing. Existing and conventional dyeing technologies used by local industry were evaluated and the recipes in-use re-formulated by the CCRI. Comparative dyeing cost calculations were made for the different systems. The implementation of improved technologies for dyeing and drying was monitored, and environmentally safe dyestuffs (i.e. acceptable for export markets) were developed, promoted and introduced. 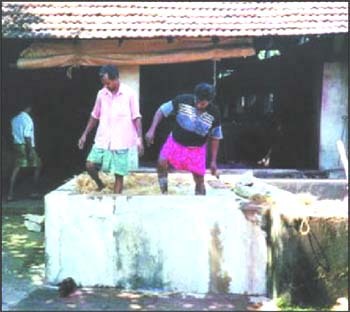 Traditionally, coir is dyed in large vessels (made of copper or aluminium, 1 200 mm diameter and 750 mm high) heated by fuelwood (Figure 4). The required quantities of dyestuff (depending on the depth of shade required) and chemicals are added as a paste when the liquor in the vessel has reached the required temperature. For dyeing 60 kg of coir yarn a fibre to liquor ratio of 1:12 is used, while smaller quantities of coir fibre (30 kg) are dyed at a 1:20 ratio. 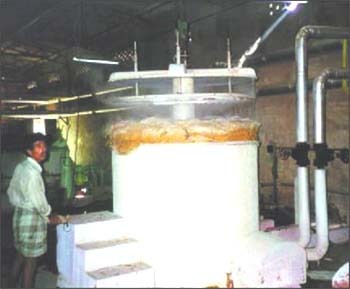 The dye bath is stirred manually and the material is turned frequently to obtain even distribution of the dye. After dyeing the material is removed, washed with cold water and air dried in the shade. Some mechanical improvements include the use of special-purpose fixed stainless steel vats equipped with a valve for draining dye effluents. Heating comes from electrical elements built into the housing of the vat (Figure 5). 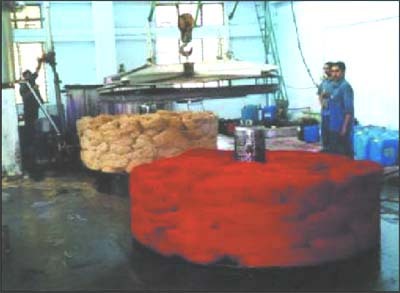 The mechanized system of coir dyeing developed by the CCRI includes the use of dye vats with forced circulation of dye liquor, to give uniform dyeing. Combined with a temperature controlled dyeing process, shade consistency is improved. 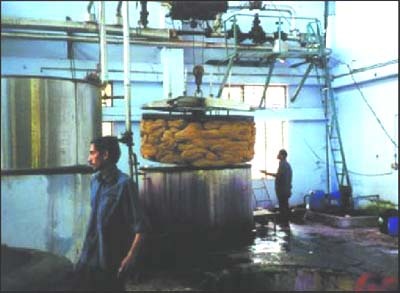 After hoisting the dyed coir yarn (Figure 6) from the vat and draining and spin drying, the fibre is dried in a conventional drier (convey or belt/hot air). The higher costs of dyeing by this method are compensated by better quality dyed coir materials and improved consistency between batches. In addition to the number of commercial companies involved with dyeing, some larger co-operatives have also introduced mechanized dye-house methods, based on the CCRI dye-house model (Figures 5 and 6). A number of smaller co-operative societies have established joint facilities for dyeing, to accommodate the batch production of small quantities of fibres or yarns. Options and opportunities for setting up additional central dyeing house facilities of this kind should be considered by industry at large. Several international chemical companies were requested to provide samples of dyestuffs for experimental purposes by the project team, but without success. Dyes were obtained only from local suppliers. A literature survey yielded a few recent local publications on toxicity of dyes and a list of obsolete or non-specified Chemical Abstracts references. Nevertheless, a set of experiments to evaluate the various dyes was planned in detail, implemented and undertaken satisfactorily. Testing for fastness of dyed coir materials was qualified visually. Arange of chemical additives was used and new ranges of shades were developed by a combination of different dyestuffs. The absence of equipment was noted, for this was detrimental to the progress made. Experiments to use the crockmeter to assess rubbing fastness were carried out in cooperation with the South India Textile Research Institute (SITRA) at Coimbatore. Research on the influence of fibre pre-treatment (retting, softening and bleaching) on dyeing performance should receive more attention in any future R&D programmes at the CCRI. The aim of softening is to improve the feel of the coir products, since the coarse and hard fibres tend to protrude from the yarn and woven matting and this is detrimental to feel. Improvements would have a positive impact on the appeal of the consumer towards the use of coir floor coverings. Methods similar to sisal yarn finishing could be used, such as singeing (but with inherent fire risk involved) or cropping the yarn to improve product quality. There are several chemicals on the market for softening textiles that have been investigated by the research team at the CCRI32. Different textile finishing chemicals have been tested. The cheapest method found was an alkaline treatment, which was effective to a certain extent, but was detrimental to the strength of the yarn. Scouring agents are used before the application of softeners. The use of epoxy based softeners and (amino) silicon-derivatives have been investigated in detail. The best performance was obtained with the silicones, but this did not give fully satisfactory results, as the yarn had a slippery feel. Moreover, the costs of the chemicals were such that it would probably prohibit their introduction into domestic coir processing industries. Thus far, no suitable chemicals have been found for softening coir yarn satisfactorily. It would be beneficial to industry if the softening of fibres could be undertaken prior to spinning by hand. Irregularities in the make up of the yarn are part of the reason for roughness. Other comparable plant fibre yarns (such as jute and sisal) are spun with the aid of a batching oil, which facilitates spinning. A vegetable oil (castor oil) was successfully applied to evaluate its effects on spinning performance (based on breaking counts, strength, texture, etc.) and preliminary trials for scaled-up production (to 500 kg) have been undertaken. It was found that a better quality yarn (less hairiness) could be spun with the modified fibre. The dye uptake of these oil-treated yarns was comparable with untreated yarns, without loss of softening. The use of batching oil is considered to be essential for the production of sliver for use in fully mechanized spinning systems. Bio-softening was another approach explored by the CCRI research team, to improve the softening of coir fibres. This research is currently underway alongside the bio-bleaching work, and aims to achieve a bio-polishing effect with the use of specific microorganisms, with selected enzyme specificity towards surface cell wall components. However, no detailed information was available to describe the effect of the different components on the physical properties of the fibre, at the time that the work programme of the CFC/FAO project was concluded. The rigid lignin network between fibre cells prevents flexible behaviour. Softening of the fibre without affecting the fibre strength will be a considerable challenge for future work. Quantification of the effect of softening remains a problem. Measurement of the flexural rigidity has been developed, but the results do not comply with sensorial perception. So far only subjective qualification has been possible, which necessitates further design of testing protocols and methods to assess the effect of softening on the yarn or fabric surface. The perception of softness of a yarn is not directly related to the bending of the fibre, as was earlier assumed in the testing device developed by the project team for measuring flexural rigidity. A relevant database on information of chemical treatments for softening textile materials was collated, although the number of recent reports available was strictly limited. A laboratory was set up and orders were placed for supplies of glassware, chemicals and equipment based on a number of invited quotations. Anumber of different recipes to attain fibre softness were considered and selections made on the basis of well-reasoned theory and with respect to the economics of the processes involved. Commercial products from national and international supply companies were considered. Experiments were reported in detail, although only limited quantitative data could be produced. Some possibilities for bio-polishing were explored. The effect of the various chemical treatments on the appearance of the yarns was recorded and, in some cases, strength parameters (tensile and elongation) were measured. Unfortunately, the methods used were not described nor was statistical data analysis undertaken and, consequently, no conclusions were drawn from experimental findings. No equipment was available to the project team to measure the effects of the different chemical treatment on the stiffness and strength properties of the fibre. So far the research into softening has been successful, although the search for cheaper methods requires further effort. The effects of the cost of the treatments on end-product prices and performance ratios should be discussed with those in domestic industry, for there may be some interest in supporting further work of this kind. Chemical recovery and effluent management should receive further attention, and well before the industrial implementation stage. This will ensure that any new processes are environmentally benign. Better access to up-dated international literature will improve the performance of the project team for any future work. Direct contact with the chemicals supplying industries will facilitate the implementation stage, and help provide for a more appropriate and far-reaching range of experiments. 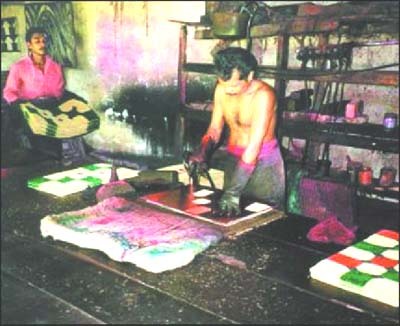 Stencil printing has been introduced for the production of a diversified range of coir products, and is now common practice with the manufacture of coir mats in southern India. Print design is preferred over weaving design and applicable for most creel, carnatic and fibre mats. The most common technique currently in use is dye spraying over a stencil plate, in which the pattern has been cut away (Figure 7). The number of stencil plates available depends largely on the number of colours used in the design. Thus far stencil designs are largely made traditionally, with sketching and cutting of the separate plates by hand. Computer added design (CAD for generating new designs is being introduced. Due to the uneven surface of the mats other methods of stencilling/pattern application have not been considered suitable33. Alternatively, the dye can be brushed on to the coir mat, which gives better penetration of the dye and with less dye wasted on the stencil plate. This method is, however, more labour intensive and thus not used on a significant scale by domestic industry. The use of reactive dyes in printing has been investigated by the project team, but found to be too expensive for local industry. The advantage of better fastness of reactive dyes is overshadowed by the less satisfactory colours produced (less brilliant) and costs, which are higher than those derived with the use of traditional basic dyes. Durability of the print is not as yet an important marketing issue, and thus work with reactive dye printing has not been continued. The CCRI purchased a complete CAD system (funded by the Coir Board of India) in support of their dyeing R&D programme (independent of the CFC/FAO project), which enables the designer to transfer novel designs quickly and easily to stencil plates. The flexibility of the system is a considerable advantage and allows for a more diversified range of product design. Further, products that can be specifically tailored to meet the demands of a particular client (Figure 8). The CCRI has introduced CAD facilities to domestic industry, and charges apply for the stencil plates produced. Higher rates are charged for more exclusive of designs. From the literature available on textile printing, a number of suitable pigments and formulations for printing were traced. Industrial inquiries were undertaken to survey the suitability of current designs on different coir products. 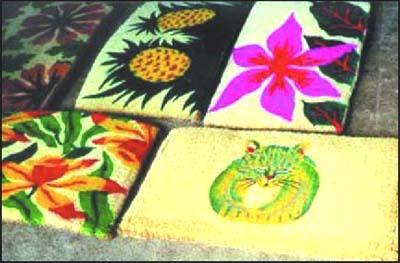 Novel designs for coir products that make use of stencilling techniques were investigated. Other techniques (e.g. non-stencilling) were not explored or introduced due to the uneven surface of the products. There is a crucial need for industry to develop new designs that will encourage market development. This may enable coir products to be re-positioned within the different fibres markets for mats and/or wall coverings. Other remaining objectives from the programme of the CFC/FAO project are the development of print methods and materials that are rubbing, light and wash fast. Coconuts thrive in wet tropical climates, where monsoon rains prevent drying of wet processed products in the open air for much of the year. Therefore, it is essential for industrial productivity and export markets that suitable drying equipment be available at the various stages of production, to enable producers to continue to supply markets. Suitable drying equipment should meet criteria for throughput, reliability, ease of use and cost effectiveness. The CFC/FAO project set targets to develop a cost-effective drier for coir fibres based on low cost energy use. The CDA project team in Sri Lanka undertook this work. Domestic exporters recommended requirements for a commercial drier capable of handling a fibre throughput of two tonnes per hour, and with moisture reduction from 50 per cent to 15 per cent in a single pass. Suitable drying technologies for coir products should be cheap and effective. The more sophisticated technologies in use in modern food industries such as vacuum-drying, freeze drying, microwave drying or radio-frequent drying are neither practical for bulky fibre products nor likely to be economically viable. 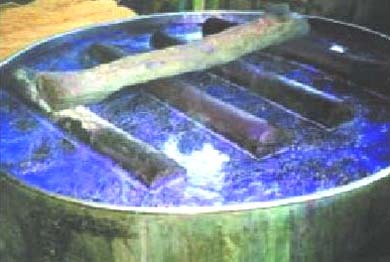 Drum drying is a conductive drying technique with efficient heat transfer, in which contact time with the hot drum is important. It is especially suitable for flowing powders. Hot air drying is the most obvious method for drying coir fibres, where drying rate can be controlled by air temperature and velocity of materials flow. In a fluid-bed dryer (or, alternative, spouted, pneumatic or vibrating bed dryers) the contact of the fibres with the air is improved by stirring the material, which results in a higher heat transfer coefficient to the product. The efficiency of the process is largely dependent on the cost of energy for generating the hot air. Developing and implementing the R&D activities required for drying was difficult from the outset. The CDA, which provided services and facilities to domestic coconut industries, was not equipped for fibres R&D, and the need to gain access to a fibre laboratory was considered a priority. Neither the Coconut Cultivation Board (CCB) nor the Coconut Research Institute (CRI) in Sri Lanka are directly involved with fibres research, but manage programmes for growing, breeding and other agronomic practices, and for the production of copra-derived products. An engineering team was put together and the various project components were explored with some preliminary design work which considered options for the different sources of heat energy available, and the preferred choice of design of drier. This eventually centred on a drum with rotating baffles and wet fibre feed at one end and discharge of dry fibres at the other. Heat was provided from an oil-fired furnace. A fibres laboratory was established at the main CDA office in Colombo. Practical work involved the construction of a pre-prototype drier and testing followed by modification and re-design. A second rig, designated a prototype was constructed and also tested and demonstrated to domestic fibre manufacturers (Figure 9). Work was undertaken at a commercial fibre mill in Lunuwila and at the CRI. 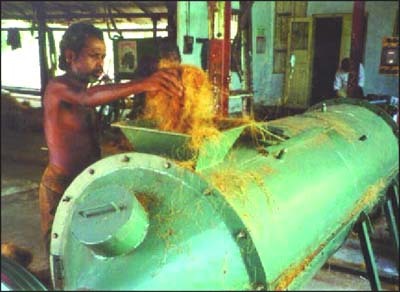 The value of the fibres laboratory established in Colombo was strictly limited, and the equipment installed was insufficient to perform the most basic of tasks. Preliminary measurements were undertaken with borrowed equipment, although basic data on fibres drying was not available. Equipment available for measuring moisture content did not perform well, and an improved device for moisture measurement in the field was constructed and tested. Trials were carried out that satisfactorily conformed to the requirements specified in the draft Sri Lanka Standard for Mattress Fibre. Lack of information to describe the basic characteristics of fibre drying was a disadvantage that raises issues for the choice of design of the drier, and for the choice of heat energy. Motives underlying choice did not conform with conclusions that could be drawn from a more fundamental survey of existing drying systems available to the sector. The project team accepted costs (for drier and energy) on the basis of the scale of operation required, small-scale and of the order one tonne day of fibre throughput. The drum design selected was only suitable for processing fibres which were non-orientated. The performance of both drying rigs was explored. Several passes (3-4) were necessary to obtain the required levels of drying (moisture reduction) for the batch of fibres under test, although performance was superior with the prototype drier (the second drier). Capacity was far too low to make the rig commercially viable. For a target production of one tonne fibre throughput per 10 hour day (dried to 15 per cent moisture), an input of at least 1.35 tonne wet fibres is required, equivalent to a capacity of 2.25 kg/min, not taking into account levels of pith contamination. With high levels of pith adhering to the fibres throughput was considerably less than 2 kg/min, thereby producing production runs that could not meet targets. Notwithstanding this lack of throughput, demonstrations were made to invited fibre millers in 1997 (preprototype) and 1998 (prototype), and the work of the CDA project team was generally well received. Feedback was positive for the work programmed, for the effort made by the CDA project team and for the equipment. Many suggestions were made for modification to the design of the drier and to the programme, for implementation post-project. Given the experimental nature of the drying equipment and the investigations made, an element of extrapolation is required to project this work into the practical reality of large-scale drying that will be required of industrial drying practices for coir Sri Lanka. Location of plant, design of plant, materials flow into and out of the plant, choice of energy resources and the development of an industrial processing model that suits the current modus operandi of mill owners, is likely to result in a more cost-effective and efficient operation. Planning for this will be essential post-project, if domestic industry is to provide a drying facility for those periods of the year when rains limit sun-drying. Some form of centralisation and/or cooperative venture may be undertaken between the different mills, with the mill owners responsible for the financial investment required of the venture. Managers of the drying plant may also be able to undertake certification of the fibres dried, which will provide a measure of quality for the end product and boost the value of international sales of fibre. The work of the project team has stimulated local industry to consider these and other future options. For more than six months in a typical year, rain places limitations on drying and this results in the production of mixed quality fibres. The project has raised some of the issues involved, and encouraged local industry to become further involved. It remains early days, however, and much additional work remains to be done to produce appropriate design drying equipment/systems with a choice of options that will encourage commercially viability. The choice of power sources for the drier was always an issue with important economic implications for the use of electricity or fossil-based fuels for heating. The environmental issues that influence choices, however, are firm and should be considered for any future options. Solar heating systems could be an alternative, with or without conversion of biomass (heat energy derived from photosynthesis), for example, with the production of heat by fermentation or direct combustion. Resources available to the coir industry include large quantities of waste biomass (coconut shells, waste fibres and pith). A comparison of the incremental costs of unit power should be made throughout the life span expected of a drying plant that the various options can be factored in. This will also enable realistic operating costs to be established, and thus charge out rates for users to be scaled accordingly. No investigations were made of drying systems used for tea or copra, for example, both of which are available in Sri Lanka. Neither were options explored for use of equipment that would burn wood chips, 23 cocopith, shell and other crop residues. Comparative evaluations of this kind may have helped to enable efficiencies and, importantly, economies of use to be determined. Enhanced performance would have been obtained if some preliminary calculations had been made before design was finalised to determine, for example, energy input, optimal temperature and fibre residence time in the drier with changes in airflow, capacity and similar. Heat loss for the design selected was large, and corrosion levels on the fabric of the drum are expected to be high. Drying contaminated fibres was found to be wasteful of time and energy, and some form of pre-cleaning operation should have been considered and introduced. This is recommended for any continuation of the work on drying.